This German StuG III Ausf. 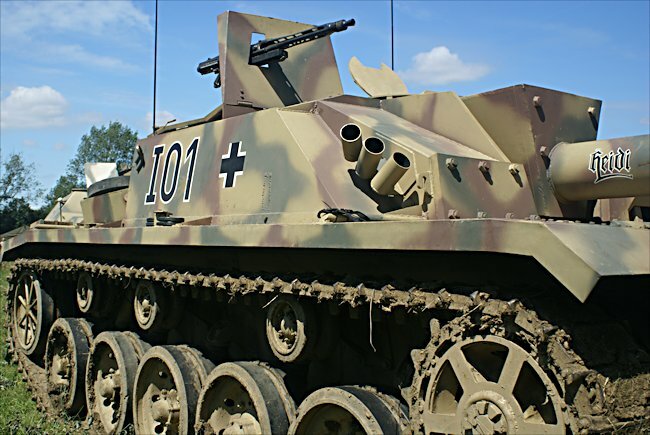 G tank destroyer replica 101 is owned by a military historical reenactment group based in France and is often seen at military vehicle events in the summer in Britain like the annual "War and Peace" Show in Folkestone and mainland Europe. 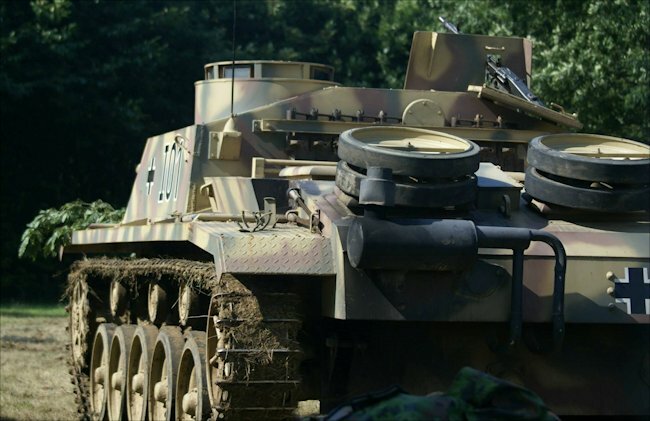 It was built by Heinrich Heimann who also built the 'Helga' StuG III replica. He has built several other StuG III, Panzer II and Panzer III replicas that can now be found in Germansy, Australia and America. The upper hull was built on top of a British cold war era FV432 armoured personnel carrier chassis. Tank Ace Michael Wittmann was a StuG III commander! The StuG III assault gun was used widely on the Russian Eastern Front during World War II. T was cheaper and easier to produce. It used the chassis of the outclassed panzer III tank that was being replaced by the Panzer Mark IV and Tiger tanks. It had a very low profile which made it ideal for concealment and ambushing the enemy. Michael Wittmann was a German Waffen-SS Tiger tank Ace. He started his career in a reconnaissance unit and later as a StuG III commander in Russia. The main foe he had to deal with was wave upon wave of Soviet T34/76 tanks. They were superior to many of the German tanks. They had a very good 76mm gun and sloping armour on the front and sides which made it very difficult to penetrate. 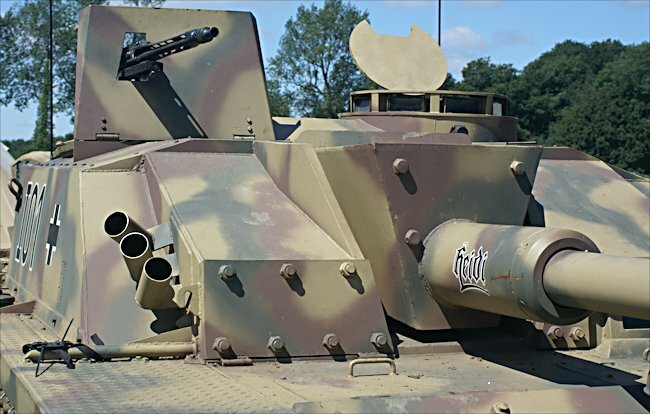 This German StuG III Ausf.G tank destroyer replica 101 has used the chassis of a cold war armoured personnel carrier. The wheels are bigger that on the original StuG III and there are only 5 lower wheels not 6. One of the things that the German tank crews noticed was that the level of competency and training of the Russian gunners was poor in comparison to their own. They very rarely found their target with the first shot. He was ordered to scout out the location of nearby Russian forces on his own in hos StuG III. The regimental war diary recorded, "Wittmann drove his StuG to high ground to try and locate the Soviets. He spotted two groups of T34 tanks: six coming from the north east and another 12 coming from the north west." "That meant 18 T34s against Wittmann’s singel assault gun. It was no match. Wittmann had to act quickly to even the odds. He ordered his driver to tank the StuG III of the high ground." Wittmann had been ordered not to engage the enemy tanks as they out gunned his Sturmgeschutz which had been designed as an infantry support weapon and not a tank destroyer. It did have a good 75mm high velocity cannon that could do a lot of damage if it found the right spot on an enemy tank. It had a traverse of only 24 degrees. To properly aim it in another direction the whole tank had to move so the front faced the enemy. Despite being out numbered and out-matched by the Russian T-34 tanks Wittmann decided he would stay and fight. He was now down on the valley on the other side of the high ground. He knew that the Russian tanks had to come over the top of the ridge and in doing so would temporarily expose their under belly. A weak spot in their armour. He also knew about the other weak spot on the T34:the joint where the turret met the hull. The regimental war diary continued, "Wittmans only hope was to set up an ambush as the T34s crested the hill. The first shot was a direct hit. The second T34 surged over the hill. Ig went up in flames. A third T34 managed to get a shot at Wittmanns Sturmgeschutz but missed. More Russian tanks poured over the ridge. There were just too many. Wittmann headed for cover. He used the StuG III’s low profile as he headed for cover in a small wood. Facing so many T34’s there was nowhere for him to hide. Wittmann’s driver swiveled the StuG to face the enemy. Again his gunner scored a direct hit." He hit the tracks of another tank and this made the tank swivel around exposing the side and rear of the tank. That was hit again. He fired again and again. Six of the formidable T34’s were destroyed in just a few minutes without his StuG being hit by enemy shells. Wittmann and his crew single handedly stopped this Soviet attack, the other tanks retreated. For his courage he was awarded the Iron Cross 2nd Class. He was sent back to Germany to train as an officer in the SS.